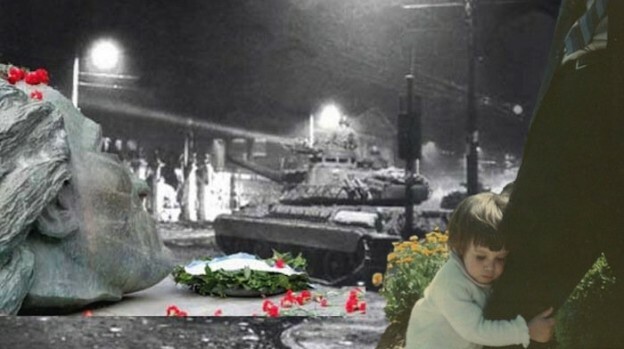 On the occasion of the Athens Polytechnic Uprising against the Greek Junta, Leslie Absher, the daughter of a CIA operative stationed in Greece during the military dictatorship, remembers the events that brought down the regime forty one years ago Monday. Leslie arrived in Athens as a baby before the coup, brought there by her father, a young spy on his first mission. “There is much I’ll never know about his work in Greece but my love for him and Greece calls me to never forget this historic day,” she wrote to Greek Reporter, describing her complicated relationship with Greece and her CIA dad. Forty one years ago today, the Greek military bulldozed the main university gate in Athens, killing students and signaling the end of the seven-year dictatorship. The students’ decision to barricade themselves inside the university, even when the tanks showed up, was a brave one, and led to the dismantling of the junta. We don’t mark this day in the U.S., even though our country played a role in supporting that dictatorship and most Americans don’t even know this happened. And it’s true that even in Greece, where this day and its significance is well-known, the acts of remembrance — leaving carnations at the university — is slowing down, and has been for years. Every November, a Greek American friend who’s lived in Athens for decades, goes to the site and leaves a flower. Then she posts on Facebook about the low turnout. When I saw the bulldozed gate a few years ago, I didn’t recognize it at first. I had gone to the university to honor the uprising when I noticed a heap of metal resting askew on the ground. I thought it was a pile of debris. It took a second for it to hit me: I was staring at the original gate. I was there because I was an American, a citizen of the country that had been complicit in tolerating the dictatorship. I was also there because my father had been a part of the U.S. presence in Greece back then, a spy on his first field assignment. I was two when the dictators took over. Four years later, my father’s tour ended and we left. At that point, I was supposed to resume my American childhood. But that’s not what happened. On some level, I stayed Greek, not Greek Greek, but quasi Greek. The country and its culture never fully left me. I’ve talked to other kids of spies and it’s the same for them. We grow up in other countries, our parent gets reassigned and even though we leave, the culture we left behind stays buried in our bones. I spent five years living in Athens, spoke Greek, and have vivid memories of going to the laiki, the market, or the beach at Glyfada. But what’s stayed with me most is a feeling, the recognition of a culture I had once known, and had grown to love. I’ve since been back to Greece many times, strengthening my feelings of connection. When I try to pinpoint exactly what it is about Greek culture that makes me feel so connected, I come up with generalities – a self-deprecating wit, a penchant for emotional intensity. But the country and people are far more complex than this and I can never really answer this question. I just know that every time I go to Greece or hear or speak Greek, a part of me feels home. This home feeling is why I’ve spent a good part of my life writing about my connection to Greece, and what it’s like having a CIA dad who was stationed there during the dictatorship. Ours is a complicated relationship. For decades, I struggled with our differences – I was the liberal gay daughter and he was the conservative spy. And I carried shame for years, my whole life it seems, about whatever he did or didn’t know about the coup and dictatorship. I love my father and although we had numerous conversations about the junta, I’ll never fully know what his work there entailed. He was no proponent of dictatorships, yet for me, he was still part of a U.S. government that tolerated the dictators, which is why, on this day every year, I make it a point to simply stop and remember. This article originally appeared in Greek Reporter.